Join the #fdbloggers Twitter Chat Today at 12pm PDT – I’m Hosting, Too! Hi guys! The lovely Loriley Sessions of the UK-based #fdbloggers Twitter chat has graciously handed over the hosting reins to me this week! I’ve been excited to host the weekly conversation with foodies and bloggers from around the world, and the day is finally here! So, in about an hour, I will be hosting a foodie Twitter chat that I hope you can join in on to connect with a bunch of wonderful people who love food and meeting others! 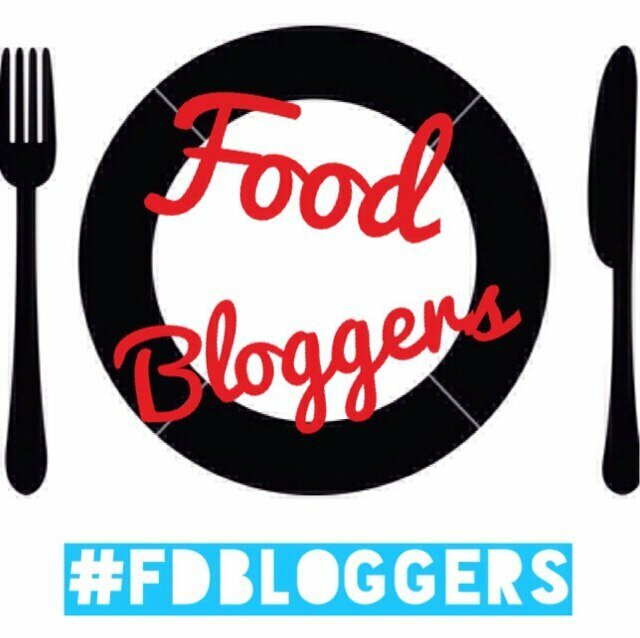 To join in, you can connect with me @TanayaG on Twitter and follow the #fdbloggers hashtag. Topic is The Social Foodie. All things food in the social aspect, online and in the real world! Hope to see you there today at 12pm PDT. Everyone is welcome to join in! Were you, by any chance, aware that July is National Hot Dog Month? After doing a little fact-checking, I found that the National Hot Dog and Sausage Council even confirms this! It only makes sense, since summer is grilling season, right? To celebrate, I had the opportunity to try DogHaus for the first time. I’d been meaning to try it for quite some time after hearing all the hype, so talk about perfect timing! DogHaus has even brought on chef and TV personality Adam Gertler as their Würstmacher, and I’d actually interviewed him back in 2012 (interview right here). This would be the first time I’d get to taste these creations… so naturally, all signs pointed to yes, let’s try this place already! 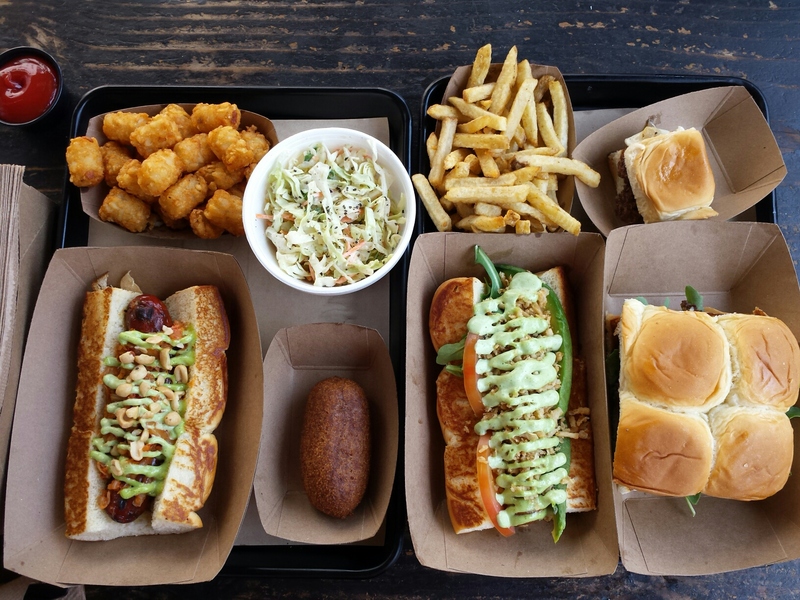 DogHaus has multiple locations around Southern California, and just recently opened its first franchised location in Canoga Park. I visited DogHaus Biergarten, located in Old Town Pasadena, and found it to have a unique vibe and a great selection of craft brews and knowledgeable staff to go along with its innovative dogs. Biergarten Manager Tony Pereyra is a jack of all trades, even lending his bartending and event coordination skills to the Biergarten location’s success. He and most of the staff have worked at the space even before DogHaus came into existence, about 3 years ago. Tony sat down to chat with us, and explained that the uniqueness of the spot lends itself to the location. Since it’s a bit off the beaten path (you have to enter through a side alley– pretty cool! ), and not in your typical nightlife-filled area, I had to ask why they stayed open until midnight or 2 a.m., depending on the night. Turns out, late weeknights become impromptu industry nights, as staff from surrounding restaurants have made DogHaus Biergarten their go-to late night spot to mingle after-hours. The “One Night in Bangkok” is one for the adventurous flavor-seekers, and for those who like a bit of heat on their dogs. If you’re bored with the traditional hot dog, this baby is for you. The juicy Thai red currywurst packs a nice amount of heat. 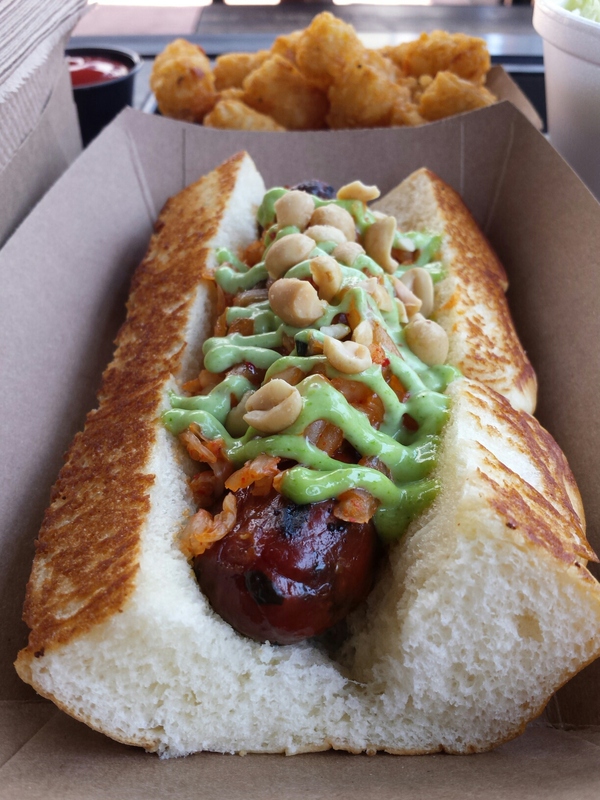 The cucumber kimchi relish adds acidity to cut through the heartiness of the meat, the richness of the creamy cilantro aioli, and the saltiness of the crunchy peanuts sprinkled atop the dog. There are definitely some amazing Asian flavors packed between those sweet Hawaiian buns! The “Sooo Cali” Dog has some classic SoCal flavors lying between those two signature Hawaiian bread buns. 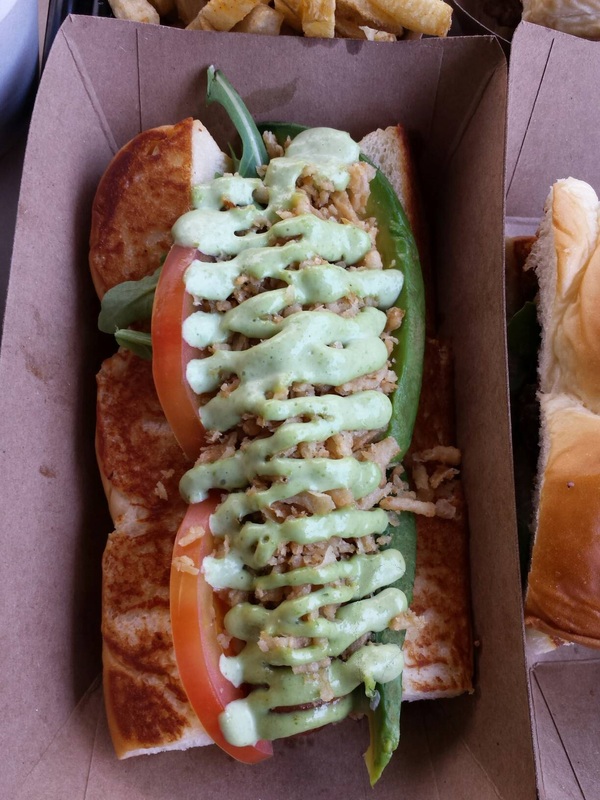 On this all-beef skinless dog, you’ll find fresh tomato and buttery avocado slices, along with an aromatic basil aioli and some fried onions for a nice crunch. This hot dog, being one of the originals since the first DogHaus location, has won awards from the likes of L.A. Weekly a couple years ago. Just a few months ago, chef Michael Brown joined the DogHaus team. Just to give you an idea of his culinary chops: he’s been involved with Red O’s opening, and has also served as executive chef at Google and the Nike World Headquarters before heading to the DogHaus to become culinary director. I can’t wait to see what’s next on their ever-evolving menu the next time I’m in Pasadena! 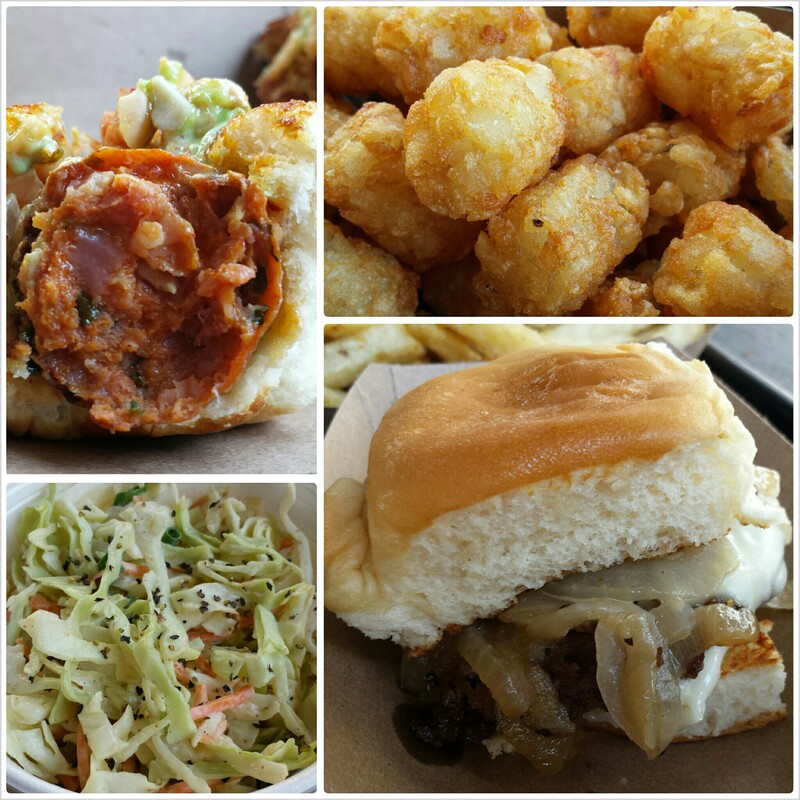 At this particular lunchtime feast, there were tater tots, French fries and coleslaw galore. So many sides, plus Tony insisted we try a couple happy hour items as well. So good! Let’s just say that if you came here a few times a week, every week, you still wouldn’t get bored anytime soon. DogHaus Biergarten has late night happy hour from 10 p.m. to close, and Sundays truly are Sunday Fundays with an all-day, all-night happy hour. Happy hour favorites include the $1 burger sliders with white American cheese, caramelized onions and a dab of mayo (pictured above… and absolutely delicious). The mini all-beef corndogs with a root beer and cornmeal batter are also a favorite come happy hour, along with great craft beers and more. You can check it all out here, or just stop by when you’re in the area. I definitely plan on going back soon, especially when I don’t feel like grilling in the heat! Speaking of grilling season, some of my favorite toppings for DIY summer grilling include pickled red onions, sliced avocado with lime, Sriracha aioli, fruity Not Ketchup (so many great flavors! ), or some good ol’ whole grain mustard with a zing. I’m always on the lookout for some interesting topping ideas, so if you have any go-to’s, feel free to holler. More summer finds to come! Below is a guest post I wrote for the PRSA Young Professionals blog on “Chef” and the public relations industry. The film resonated with me on many levels. Not only from the PR perspective, but also many other facets of my identity– writer, food editor, travel lover, budding entrepreneur… and most of all, foodie adventurer. I wouldn’t willingly watch many movies over and over, but I’d definitely watch “Chef” again! I hope you get to see (or have seen) this movie, and that you enjoy(ed) it as much as I did! 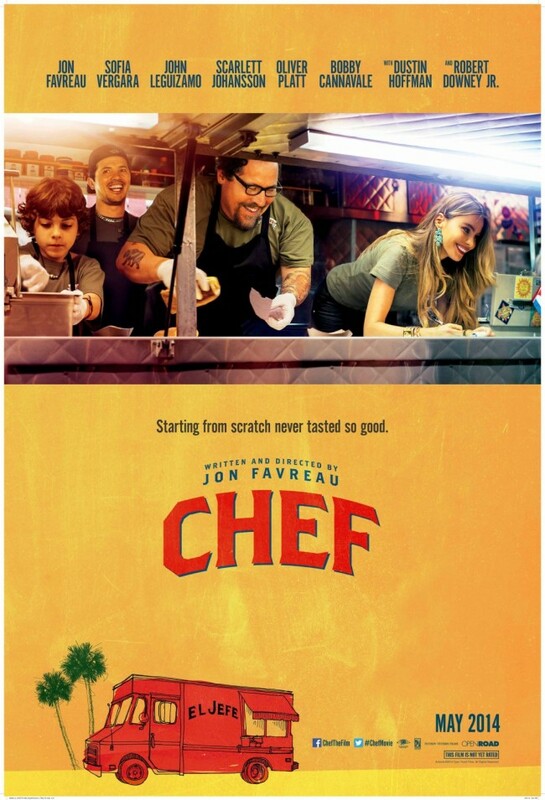 While watching the much-lauded film, “Chef,” I noticed that a lot of things actually made sense about the film. Not just the accuracy of the culinary scenes (which, too, were spot-on), but also a few aspects related to public relations. Being a PR strategist but also having worked on the journalism side, I found myself cheering the film on for some very important points it successfully illustrated. My hope is that this will help those not in our industry to better understand a few things about our work as well.